I often get a lot of questions as to what the best choices are when buying drawing or painting supplies. My personal opinion is to try out different tools and use what works for you. However, I do understand that if you are new to drawing or painting you may find the endless amount of choices to be overwhelming and a bit confusing. Many times we end up purchasing the wrong materials for our projects. So I thought I would show you some of the materials I use to help you make some decisions. 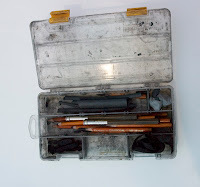 Today, I will start with charcoal drawing materials. 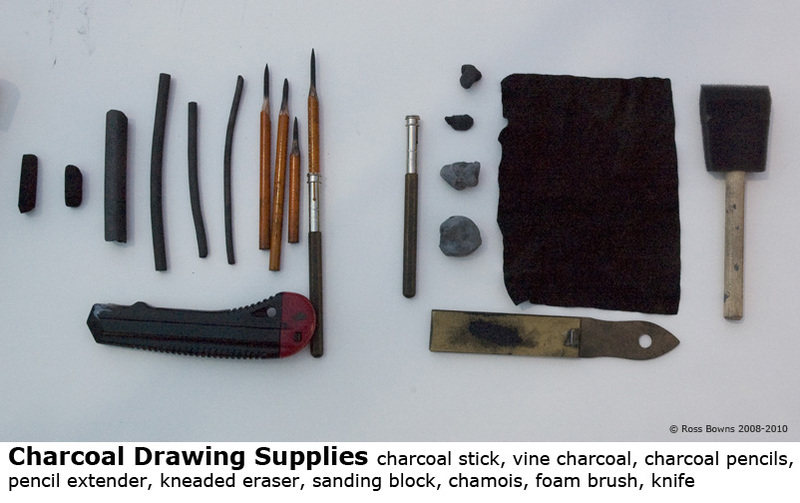 The set of materials I use in charcoal drawing. Included in this picture are compressed charcoal sticks, vine charcoal, charcoal pencils, pencil extenders, kneaded erasure, sanding block, chamois, foam brush. This is not a complete list of what is available and there are other tools one can us as well, but this is a good starting set. Before I go into the details of what to look for in the materials I want to say something about starter kits. I think these kits make great gifts or are for someone who just want to experiment. But if you have a sense of what you want to create I would recommend avoiding the kits and purchasing the materials individually. It may seem more expensive that way, but you won't end up with a bunch of stuff you don't need, nor will you need to go back to the store to buy something you needed that the kit did not have. In the long run you will save money and have exactly what you need. Though you may not recognize it most of us are familiar with compressed charcoal. Charcoal pencils are made up of the stuff. All compressed charcoal is is charcoal ground into a powder then a binding agent is added to it to harden it. 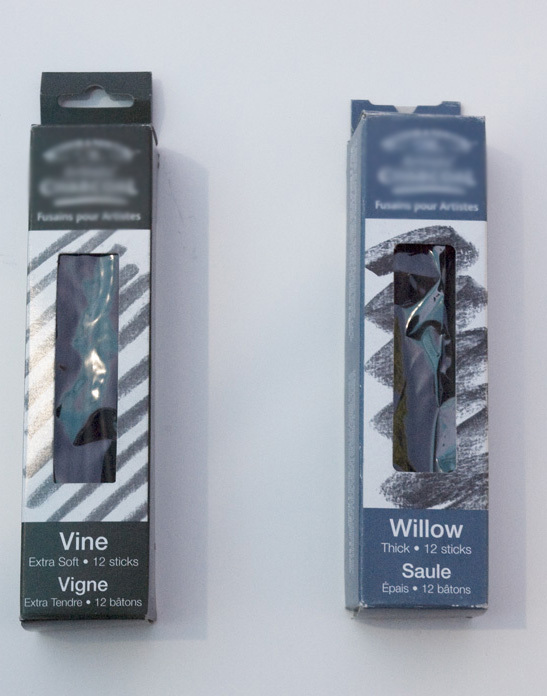 The advantage to compressed charcoal is in using different amounts of binder we can create harder and softer charcoal sticks, allowing for flexibility with the material. Though you won't hear of it referred to as uncompressed charcoal, that is the other type of charcoal drawing material. This type of charcoal is not ground down after the wood has been burned into charcoal. Think of a burnt stick from a camp fire. Lastly there is powered charcoal. It is ground charcoal with no binder added. 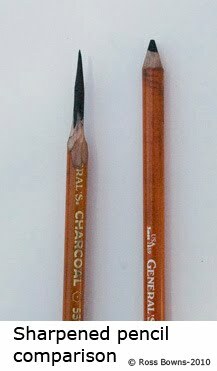 Charcoal pencils are compressed charcoal. They come in different hardnesses. That is to say some pencils make lighter marks than others when applying similar pressure to the paper. You may be familiar with 2B pencils from you test taking days. The same applies idea here. In Charcoal pencils they range from HB, 2B, 4B, and 6B. HB being the hardest charcoal and 6B being the softest. There are many brands of charcoal pencils and everybody has their preferences. I prefer Generals Charcoal pencils because they are a good quality and a reasonable price. Though I do suggest trying out different kinds charcoal pencils and see which one you may like. Not a must, but it is a good idea to get pencil extenders. Gives more life to the pencil. 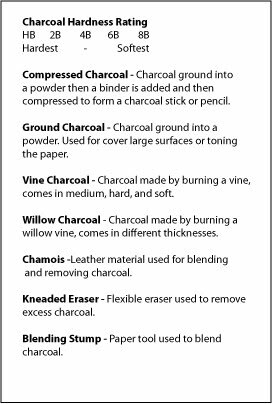 One last thing about buy charcoal pencils, read the label make to sure that is what they are. Just because they look like charcoal pencils doesn't necessarily mean they are. Even helpful art store clerks have been know to make that mistake. I like willow charcoal, I use it for so many things. Though you don't need it, I find vine charcoal to be a great way to blend, soften and mix with the pencil. 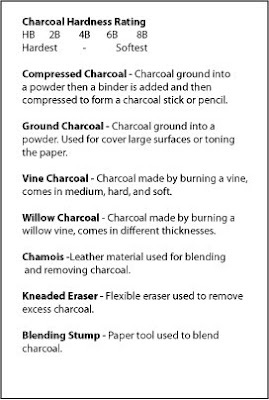 Vine charcoal is not compressed charcoal. It is actually what its name suggests it is, a vine. All it is a vine, or a willow branch burned into the charcoal form. These sticks come different hardnesses, from extra soft to hard. 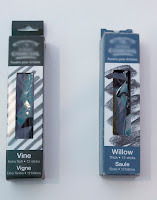 I prefer willow because it is the softest of the vines and tends to be darker than the others.. It also comes in different thickness, from thin to a Jumbo size. I generally use the thin an medium thicknesses. 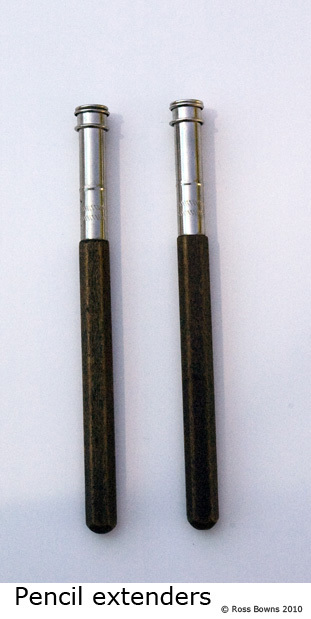 Charcoal sticks, like the pencils, are compressed charcoal. They come in many shapes and sizes; cylindrical, rectangular, thin, thick. 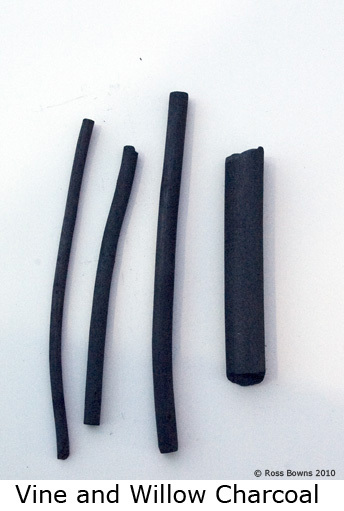 Like the pencils, the charcoal sticks also range from hard to soft. 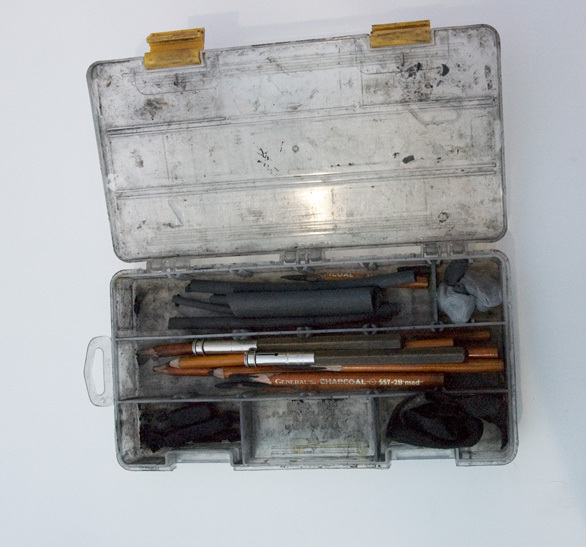 Charcoal sticks are good for covering large areas, but can also be sharpened and used like a pencil. I mostly use these for massing in large areas on the page. Compressed charcoal sticks can create a deep dark rich field. 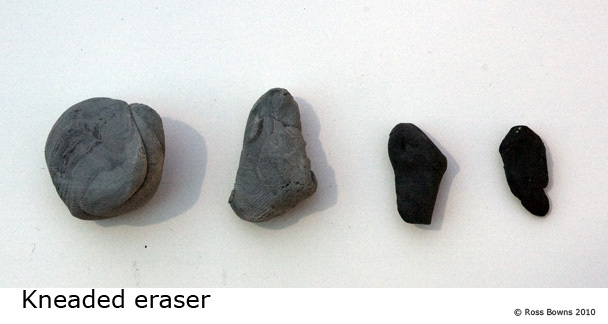 The only erasure you need for charcoal drawing is Kneaded erasure. It comes in little square packages but will end up looking like the one in the photograph. 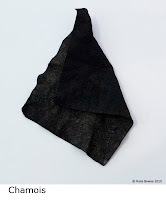 These are flexible erasures that clean easily by folding the erasure in on itself. The blending stump is a paper stump designed to move charcoal around on the paper. Personally I like to use my fingers or a chamois. But they are made for a reason as many people use them and it would be worth trying one out. Personally I don't use them, but you may find them useful. A chamois is just a piece of leather used to add, move, or remove charcoal from a drawing. When new and clean they are yellow or beige, when well used they turn to black. So when you go buy one it will look different then one in the photo. Chamois can be cleaned, but they work best once they are covered in charcoal dust. A sanding block is used for sharpening the pencil or compressed charcoal stick. If you don't want to buy a sanding block, sandpaper will work just as well. Just use a smoother grit. You will also want a knife or blade to cut the wood off of the pencil. Personally I like using a box cutter to whittle away the wood. In another post I will show you how to properly sharpen a pencil. The paper I recommend for charcoal drawing is a medium to smooth surface drawing paper. A heavyweight (70lb) drawing paper is best. I do not recommend buying the charcoal paper as that is too rough of a surface to get the soft effects one can get with charcoal. For practice news print is fine but it doesn't hold the charcoal well. Just remember these are just recommendations for getting started and there are all sorts of choices out there. The information above is offered as a starting point. You may decide to try other tools and materials that I haven't mentioned. I think that this is great. Experimentation and exploration is an important part of art and the creative process. One of my favorite thing to do with charcoal, however, is gesture drawings. It’s the perfect tool for executing the large, sweeping strokes needed to capture a gesture.